Determination of Source Geometry - The geographic description of the seismic sources in the region around the site. A seismic source is a portion of the earth associated with a tectonic fault or, if individual faults cannot be identified, with an area of homogeneous seismicity. Source geometry determines the probability distribution of distance from the earthquake to the site. Determination of Source Seismicity - The rate of occurrence and the magnitude distribution of earthquakes within each seismic source. Choice of Attenuation Functions - Relationships that allow the estimation of the ground motion intensity at a site as a function of earthquake magnitude, source-to-site distance and soil conditions at the site. of excedance of horizontal peak ground acceleration and spectral acceleration levels (and/or peak ground velocity and spectral velocity levels) is obtained and combined in the form of response spectra with uniform annual probability of exceedance. Skills that we have acquired to support our seismic hazard assessment work include development of computer codes to conduct probabilistic hazard assessments, field mapping and characterization of seismogenic structures, and interpretation/application of actual strong motion recordings. D'Appolonia has conducted fault studies in the U.S., South America, Europe, and the Middle East. D'Appolonia has extensive experience in solving liquefaction and cyclic mobility problems. Our approach involves characterizing the soil behavior under cyclic loading based on specific field and laboratory tests. Seismic slope stability is a key issue for many projects, especially pipeline and dam design in areas characterized by high seismicity. Seismic damage hazard analysis is carried out by coupling conventional seismic hazard analysis for a site and the slope response to various earthquake intensities. Amplification for certain frequencies of ground motion can occur as a result of the passage of seismic waves through a soil deposit. We assess amplification effects and have found the results are best presented to regulatory agencies when it can be demonstrated that actual records on comparable soils from equivalent earthquakes give similar results. Surface structures can sometimes cause modifications of the response of soil to ground motion. We are accustomed to conducting SSI analyses utilizing state-of-the-practice computer codes. D'Appolonia has also conducted SSI research on behalf of the U.S. Nuclear Regulatory Commission. D'Appolonia is experienced in the design of structures to resist earthquake loadings. These structures include dams, lifelines, hydropower facilities, power plants, and landfills. Our experience extends to dynamic stability analyses and the design of seismic retrofits to existing structures. We are experienced in the application of seismic design criteria under AASHTO, FERC, and USNRC regulations and various building codes. 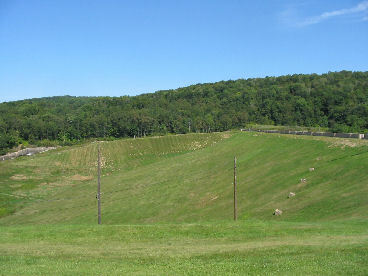 D'Appolonia performed a seismic hazard assessment for this hydraulic fill embankment dam in Pennsylvania. D’Appolonia was retained to evaluate possible geohazards associated with the siting of an LNG export facility near Idku, Egypt. The scope of work included determination of the Operating Basis Earthquake (OBE) and Safe Shutdown Earthquake (SSE) for the project site and evaluation of the area flooded by a 5000-year recurrence interval tsunami. The OLT Offshore LNG Project required construction of a large pipeline from Livorno, Italy to a floating LNG storage terminal located about 12 kilometers offshore in water approximately 100 meters deep. D’Appolonia was retained in the pre-engineering phase of the project to develop seismic design criteria for the pipeline and also to determine the potential for sea floor displacement from active faulting. Design ground motion was determined through a probabilistic seismic hazard assessment (PSHA). D’Appolonia evaluated the potential sea floor displacement from fault movements and the possible effect on individual pipelines connecting a subsea manifold to an onshore processing facility and performed a seismic hazard study. The path of the pipelines passed near a number submarine soil slopes. Seismic stability of these slopes and the potential for landslide run-out that might impact the pipelines were evaluated. The geology at the project site was very complex. Several surface fault features and a five-kilometer-diameter diaper structure were found to be present in the offshore block, and thick deposits of very soft clay were present in deep-water areas. D'Appolonia developed design criteria related to geohazards that would potentially be present along the route of a gas pipeline between Algeria and Spain. The work included a review of regional seismo-tectonic conditions and a review of geophysical data obtained along the pipeline route in a previous study. D'Appolonia also performed a dynamic slope stability analysis and mapped zones along the pipeline route that would potentially be unstable under design seismic loading.